On Saturday, March 31, 2018, the Brookhaven Easter Egg Scramble will take place at Blackburn Park. There’ll be hunts for three age groups (ages 3 & under, ages 4-6, & ages 7+), plus snacks & visits with the Easter Bunny. Though it’s free to attend, if your kids want to join in the fun, don’t be late. The egg hunts begin at 10:00 a.m. sharp. 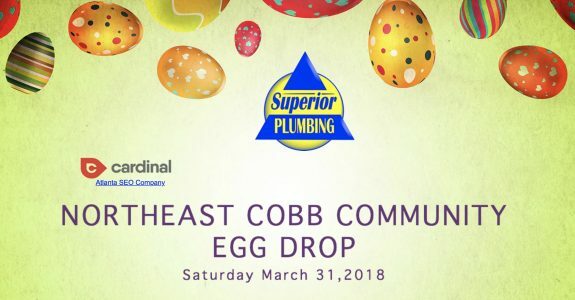 The Northeast Cobb Community Egg Drop will take place at Sprayberry High School on March 31, 2018. 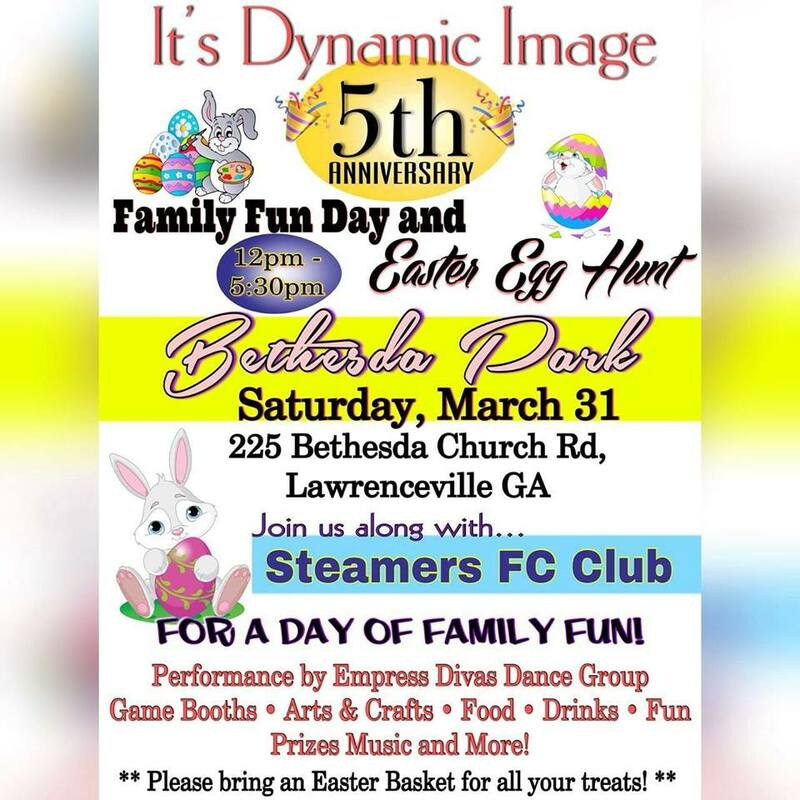 The festivities include candy, pictures with the Easter Bunny, entertainment by Peter Hart with the Atlanta Puppets, & more. The “Egg Drop” is a lot like an Easter Egg Hunt in that kids will hunt for eggs on Sprayberry High School’s football field. But in addition to the thousands of eggs that’ll already be on the field, thousands more will be dropped from a helicopter onto the field. 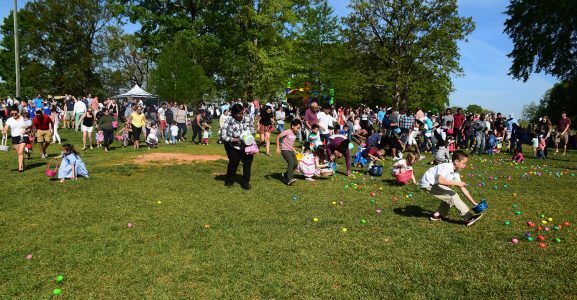 The event is well attended–about 25,000 turned out last year & more are expected for 2018, but with 90,000+ pieces of candy & eggs, there should be plenty to go around. Sprayberry High School is located at 2525 Sandy Plains Rd, Marietta. On Saturday, March 31, the Annual Easter Egg Hunt and Dog Parade will take place at Willis Park, located at 51 Dartmouth Avenue. 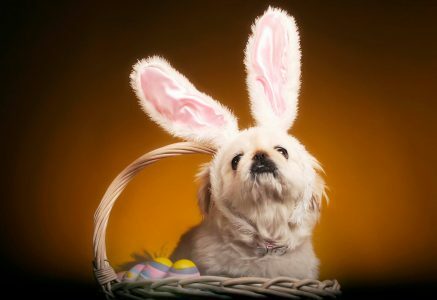 The festivities start at 10:00 a.m. with egg hunts for kids age 10 & under, followed by the Dog Parade. Costumes aren’t required to participate in the Dog Parade, but it’s fun to dress up. There’ll be awards for Best Costume, Best Owner/Dog Duo, Most Spirited/Enthusiastic, & Best Behaved. And the Antique Car Parade will take place on Sunday, April 1. Line-up begins at 1:30 p.m. at the Twin Oaks Shopping Plaza, located at 2853 East College Avenue. At 2:30 p.m., the parade starts on South Avondale Road, and it ends at Willis Park, where the cars will remain for a temporary display & refreshments will be served.